I am currently using a supplement which has improved my horse's feet. Why should I change to Formula4 Feet? Many of our customers have done exactly that and have been delighted with the improvements they have seen. For example this 12 y.o. Thoroughbred was on the recommended amount of two leading hoof supplements for over a year before changing onto Formula4 Feet. You can see clearly, highlighted by the arrow, the new, more compact horn which has grown after changing onto Formula4 Feet. In addition, the owner was paying £2.52 per day to feed him the old supplements. Formula4 Feet costs her now only 76p per day and she has a horse with better feet! If Formula4 Feet contains 65 nutrients, why are they not all listed on the label? The 65 nutrients in Formula4 Feet we quote, are the more important ones, it is not the total. Additionally, there are restrictions both in terms of space and from the regulatory authorities governing what can be included on labels. We have provided a list of the nutrients in Formula4 Feet on this website, please click here to view them. There is a tendency to judge supplements and balancers by the length of the ingredients or nutrients list. This is one of the occasions in life where length is not everything! Whilst it is important to use a comprehensive supplement to supply the nutrients for the target tissues, it is the relevance of the nutrients provided and their source which can be of vital importance for the efficacy of the product. For example, because of the unique non-GM ingredients in Formula4 Feet, it supplies nutrients to the horse when micro-organisms act on those ingredients in the horse's intestine e.g. yeast culture, cobalt and chromium, contribute to the formation of Vitamin B12 and a factor which helps horses deal with glucose. OK so how is Formula4 Feet so different to other supplements and balancers? In many ways! Formula4 Feet is made from different ingredients, all of which are of non-GM origin. The way Formula4 Feet is made provides a unique system for the absorption of certain important nutrients and provides new nutrients which are important both to ensure the hoof horn is as strong as possible and for the horse's general health. Can I feed Formula4 Feet to my in-foal mare? Certainly, the balance of nutrients in Formula4 Feet will ensure that she is getting the essentials both to keep herself healthy and to provide for her foal. I have a Competition Horse which competes under Rules; is it safe to feed Formula4 Feet whilst he is competing? Yes it is. As far as we are aware, Formula4 Feet is the only supplement which is subjected to analysis by the world's leading equine forensic laboratory before being offered for sale. Every batch is subjected to analysis for prohibited substances listed in the Common Feed Contaminants Screen by the Newmarket laboratory. Unless we get clearance from them, the product is not even packaged! I am using a balancer, why should I change to Formula4 Feet? My question is; what are you trying to balance? Are you using a cereal based diet? If so, do you really need to? Forage is the ideal diet for all but the most active horses and is a far safer way of providing energy in a form the horse is designed to use. Formula4 Feet complements an imbalanced diet by not only providing the essentials for excellent horn and skin but those which help control the excesses of glucose absorption associated with cereal feeding, e.g. chromium, vanadium, magnesium and glucose tolerance factor. Formula4 Feet is the first to recognise the importance of these nutrients in keeping your horse healthy. Formula4 Feet contains no cereals, cereal by-products nor molasses yet does provide the balance of essential fatty acids, phospholipids, elements, vitamins and anti-oxidants not present in some balancers. The protein level in Formula4 Feet seems high, why is that? Protein is expressed in percentage, in Formula4 Feet it is 22%. That means 22% of the daily amount of Formula4 Feet is protein. For a 500kg horse you should be feeding 189 grammes of Formula4 Feet per day. 22% of 189 gms is 42 gms. Such a horse needs about 370 gms of protein per day for maintenance, in a lactating mare in the first month after foaling this figure rises to nearly 1kg of protein per day. So you can see that Formula4 Feet provides 11% of the daily protein requirement for a horse at maintenance and 4% of that needed by the lactating mare. 42 gms is about a dessert spoonful! Remember that protein even in excess is not a problem for the horse, it is an expensive way or providing energy by deamination of the contained amino acids, but excess protein is not responsible for any disease in horses! My pony has a foot abscess following a "seedy toe" infection in the front of his foot, will Formula4 Feet help? Formula4 Feet will enable your pony to grow new horn, of good quality, in as short a time as possible to heal the defect in his hoof and by strengthening the rest of the hoof capsule make it less likely for him to suffer a recurrence. 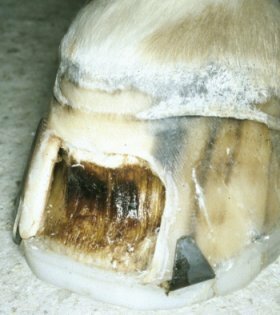 Seedy toe is an infection of the horn itself, usually at the toe and usually in chronic founder cases where the white line has become distended. Should the infection reach the corium then the problem turns into a "pus in the foot" infection. Such cases need all infected horn removing and the area left open to the air, any pus needs draining, tetanus protection implemented, but antibioitcs are rarely necessary. I have a youngster, is there sufficient in Formula4 Feet for a growing horse? The problems which youngsters develop, distorted limbs either by contracture or latero-medial deviations, are usually associated with overfeeding energy in the absence of an adequate specific micronutrient supply. Formula4 Feet provides an ample supply of calcium, phosphorus, copper, chromium, cobalt, vanadium, iodine, zinc, Vitamins A, C and E, riboflavin and of course the non-GM sources of phospholipids. If Formula4 Feet contains so much more compared to competitive products, how come it is less expensive? One of our prerequisites in developing Formula4 Feet was to make it of the highest quality ingredients yet at a price which the average horse owner could afford. We have been able to achieve this by using the advantages of bulk buying of expensive ingredients, combined with not having to pay Government import duties, as Formula4 Feet is UK made. You may not realise that the import duty on supplements is nearly 10%, this has a significant effect on the price you pay for imported goods. Why is Formula4 Feet produced as a pellet not as a powder? We are aware that not all horses which are receiving Formula4 Feet are being bucket fed. Particularly in the summer, owners need to supplement individual horses easily from the hand. We therefore produced Formula4 Feet in a 6mm pellet which is easily fed, smaller pellets tend to lodge between your fingers! As Formula4 Feet is so palatable, it can even be used to disguise medications if necessary. The other reason is that all foods degrade over time by contact with the oxygen in the air. The greater the surface area of the product the more rapid the destruction of the nutrients therein. Powders have a huge surface area compared to pellets and the larger the pellet the slower the degradation. Powders can also be blown out of dry feeds by the horse so you are never sure whether the horse received his daily quota. My horse suffers from hoof cracks. What do you advise? Firstly work with your farrier to ensure that your horse is landing evenly on both sides of his foot when he walks up on level concrete. 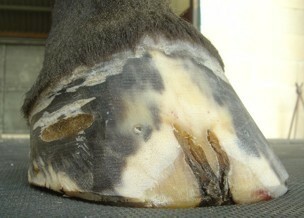 If not, the uneven landing will be causing stresses in the hoof which will contribute to the appearance of quarter cracks. Secondly, make sure his toes are not too long, as this will cause excessive bending of the front of the hoof wall: this is a major cause of toe cracks. The horse in the pictures on the right had long toes and developed a toe crack over eighteen months ago. All you can see of the original crack is a hole (white arrow), the rest of the crack is buried beneath the hoof wall. The red arrows show where abscesses have erupted at the coronary band in the past, partly healed, then new hoof has grown down. This recurrent abscessation and concurrent lameness will keep happening unless all the underlying infected tissue is surgically removed. The blue arrow shows a bead of pus which has recently burst out in the skin above the coronary band. 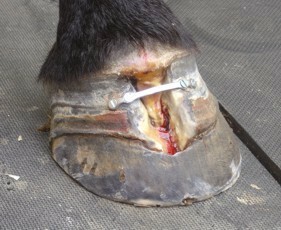 Following surgical debridement of the infected horn and catheterisation of the infected track (to flush out all the pus downwards), the top of the hoof is stabilized with a metal plate. If this is not done, or the plate is not fitted correctly, the horse will remain lame. The crack was painted with Solution4 Feet and the foot bandaged until cornification occurred. He was confined to a large stable during this period. The hoof was examined and dressed regularly and the horse was fed Formula4 Feet from the time of surgery. This ensured he was getting all the essential micronutrients to enable him to grow strong, flexible hooves which will not crack in the future. The bottom picture shows the same foot four months later when the coronary band has healed and the new horn has grown over half way down the wall. The horse was sound two months after surgery. Why have you chosen not to include a prebiotic or probiotic in Formula4 Feet? The latest evidence in the Equine Veterinary Journal casts doubts on the efficacy of the probiotics in common use today. It is a question of whether the most appropriate organisms are included in the probiotic and whether the individual strains of the organism are the right ones. Additionally, it is important that there is no genetic drift over time from the original probiotic strains used. Most probiotics provide lactobacilli, these are the very organisms which proliferate when an animal suffers from dietary laminitis, so the rationale of adding them to the diet, has for me, been questionable. The other factor is whether the organisms in the probiotic actually reach the hind gut alive, if not, they are not likely to have any effect. Until these technical problems are resolved by further research, Formula4 Feet will not contain any probiotics. However, probiotics and Formula4 Feet are compatible so that if you wish to use one, particularly on veterinary advice, there is no impediment. Prebiotics are short chain fructoligosaccharides which are designed to provide a food source for bacteria, as they are not digested by the host animal. The idea is to select the most appropriate prebiotic to encourage the "good bacteria" e.g. Bifidobacteria and Bacteroides species. The "bad bacteria" e.g. Coliforms, Clostridia and Salmonella are not able to use the prebiotic as a food source and are thus put at a disadvantage in terms of population growth. I am a little sceptical about the efficacy of prebiotics in horses as most of the research has been done on rodents. The doses of prebiotic which could be economically provided for horses is very small and one has to question how effective it would be in practice. Additionally, our experience tends to indicate that if you stick to high fibre, low calorie feeds, such as those carrying the Laminitis Trust Approval Mark, there is no need to add a prebiotic. Until further more compelling evidence of efficacy is published Formula4 Feet will not include a prebiotic. However, Formula4 Feet does contain a yeast culture which not only improves fibre digestion but provides a number of the essential B group vitamins and contributes to glucose tolerance factor. My horse has acute laminitis now, is Formula4 Feet safe to feed? Absolutely. Formula4 Feet provides the very nutrients these cases need to help them recover and maintain their health. Formula4 Feet provides the powerful antioxidants, Vitamin C, Vitamin E, BHT and copper. Tissues such as the endothelium and liver parenchyma which are damaged by a redox imbalance need these in order to remain healthy. Methionine, inositol, phospholipids and Vitamin B12 all of help the liver work optimally. Lysine and threonine are the the two rate limiting amino acids; if these are not adequately supplied parts of the horse's metabolic cycle are stopped and tissues cannot maintain their health and functions. Arginine is a substrate for nitric oxide production, a potent vasodilator. Omega 3 fatty acids for their function during the production of eicosanoids. Magnesium, chromium, vanadium and glucose tolerance factor to maintain normal glucose sensitivity. And of course the nutrients necessary for optimal hoof horn and collagen production during the recovery phase. How long will it be before I notice improvements in my horse's feet after starting on Formula4 Feet? Many owners, and their farriers, notice improvement in the horses in as little as six weeks after starting supplementing with Formula4 Feet. However, some animals take a little longer and you will notice the expected improvements in the horse's coat, hooves and general well-being within ten weeks. My horse doesn't really have problem feet. Can I use Formula4 Feet as a broad spectrum supplement? Certainly, and you will be sure you are providing him or her with probably the most comprehensive balanced product on the market today. Even if you think the feet are OK, I'll be surprised if you don't see an improvement in the horn. Additionally you are giving the essential nutrients to help maintain the health if your horse becomes "tubby". Can I use Formula4 Feet as a supplement for an older horse or one with an abnormally curly coat? Yes, the amino acids tyrosine, phenylalanine and tryptophan are the precursor amino acids for the transmitters dopamine and serotonin These two important neurotransmitters are essential to maintain the horse's heatlth. Additionally, older animals tend not to absorb nutrients as well as youngsters so that they really benefit from the 65 vital nutrients in Formula4 Feet. My horse foundered 3 months ago, a dorsal wall resection was performed, will Formula4 Feet help in this case? When performed at the right time, dorsal wall resections are a painless procedure used to optimise the healing process in foundered horses. 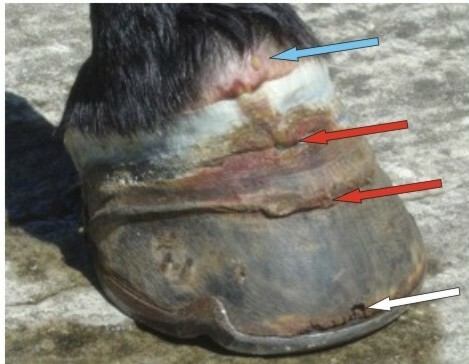 Removing the old, unattached front hoof wall allows drainage of any underlying infection, removes upward pressure on the coronary band and allows the new hoof wall to grow down at the correct angle. Formula4 Feet helps this process by providing the essential micronutrients for strong new horn to be formed in as short a time as possible to cover the defect. My horse has been diagnosed with navicular disease, will Formula4 Feet help his lameness? True navicular disease results in irreparable changes to the navicular bone, navicular bursa and sometimes the deep digital flexor tendon. However, many horses seem to be diagnosed with navicular disease when they do not have these changes but go sound after a palmar digital nerve block. This block indicates that the seat of pain is in the back part of the foot but not necessarily in the navicular bone; even if there are "abnormalities" seen on this bone on X-ray examinations. Many of these animals have a long toe, collapsed heels type of foot conformation and the pain seems to be coming from chronic recurrent corns or excessive strain on the ligamentous structures in the back of the foot. These animals will often go sound when given Formula4 Feet in combination with a different style of foot dressing and shoeing. The prinicples to adopt are to shorten the toes, ease the breakover and provide more support to the heels from a fuller shoe. [Using a shoe which raises the heels, is usually counterproductive and results in the heels being further crushed.] The exact style of shoe to use depends on the individual foot but heart bar shoes and square-toes shoes are often helpful. Formula4 Feet helps by enabling the horse to grow stronger, more upright heels once the foot dressing and shoeing style has been altered. If the horse is roughed off, trimming the feet regularly to keep the toes short and remove any collapsed heels whilst Formula4 Feet allows the horse to grow strong horn often gives spectacularly good results. I would like my horse to go unshod, will Formula4 Feet help keep my horse sound? If you want your horse to go barefooted then Formula4 Feet will optimise your chances of so doing. You will have to gradually acclimatize your horse to go without shoes. You cannot just pull the shoes and expect him to go sound; few can cope with this sudden change. However over a period of three months or so without shoes, your horse's feet will remodel and become able to cope with his previous work, in most cases. Unfortunately, a few horses, usually Thoroughbreds or those with flat feet and thin walls always have to be shod to protect the sensitive solar corium. Some chronic founder cases also have to be shod on the affected feet, in plastic or steel shoes, to help prevent damage to the abnormal white line at the toes. However, using Formula4 Feet will keep your horses' hooves as strong as his genetics and any hoof defects allows and help protect the internal sensitive structures in the foot. As you can see on the right, my pony is a chronic founder case and manages to pull me around quite happily without shoes now he is on Formula4 Feet! This summer my horse began short striding on hard ground, he seemed uncomfortable rather than lame. I began to use a hoof supplement but the problem did not really resolve until the Autumn. Can you advise? This is a very common story we hear on our telephone helpline. What has happened here is that your horse's hooves were not as strong as they could have been right from the previous winter but he could cope whilst the ground was soft. Only when the ground became hard did he start to feel his feet. The answer is to supplement his diet with Formula4 Feet now, not to wait till he goes lame or when you think he might go lame next summer. 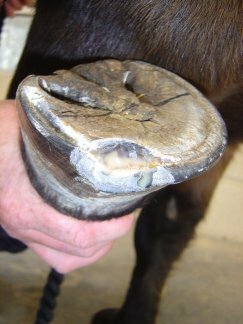 Hoof is a relatively slow growing tissue, it takes about 9 months for a hoof to grow down from coronary band to the ground, so you need to ensure that the horn is as strong as possible before his feet are subject to hard or rough going.